Imagine being as brilliant as Marilyn Singer, who created her own form of poetry. Reverso poems come in two columns. The first is read from top to bottom; the second has the same words but is read from bottom to top. Only the punctuation and the meaning changes. I love this idea and how it complex it really is to write them. 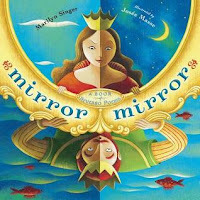 I purchased Mirror Mirror for our class' poetry unit and will challenge all the students to read the book and write their own reverso poems. It's often the student you least expect who succeeds in these challenges. Mirror Mirror's poems are all about fairy tales and usually tell two sides of the same story. Below, you'll see "In the Hood," from the perspective of Little Red and the Wolf. Singer has written two more books in this form, one about Greek mythology and the other about fairy tales. I want to add both to our collection because I love this clever idea.